God always keeps his promises. Amen! Last year when I started the Sisterforchrist page on Facebook first, I told friends and fellow sisters that God had a plan for me and everyone else and it is not always for us to understand but to follow and trust in him. A lot of people were upset that the Facebook page closed and God wanted me to move over to this blog page. Most of the sisters did not follow. He also told me that this would be the reaction and that he had a job for me that I wanted and that he needed me to do. So, I followed the lord’s command and friends and sisters were lost. But, the story doesn’t end there. I had the torn muscle, recovery, and anything the devil could throw at me. I trusted in the Lord! As I trusted he provided big time financially and spiritually, but the devil keep coming. 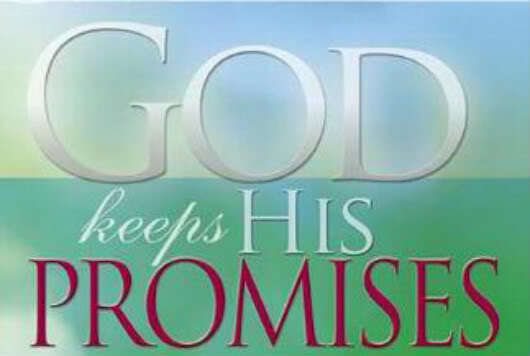 But God is the God who keeps his promises. Last weekend I was registering for classes and asking the lord what is your plan for me father? What direction shall I go? The phone rang from the dream job that I had applied to last year. Today I had my interview and was hired. So, if you believe that God doesn’t keep his promises I ‘ve got news for you. He keeps his word, but do we continue to keep the faith when we don’t see results that we want and follow his will for us! It took God a year to get back to me and I kept the faith. I did what he told me to do and I kept the faith. The devil tried to redirect me , but I kept the faith. Are you struggle with this issues? Well don’t! Trust in the father will all your heart nd all your mine and he will deliver what you need and more! Thank you for your words, they were very uplifting! I’m dealing with a job situation as well and I feel like I’ve been going through the wilderness for a long time. I’m praying for direction and trying to look forward to what He wills for me. Bless you in your obedience to what God has told you to do! You can as well! He will provide for you ! Just trust him! He will not let you down!